I feel like I should write “just a quick note” about this so that I appear to have it all together on this subject, but that doesn’t even begin to come close to describing how I’m feeling as I’m writing this, so in the interest of being completely transparent – here’s what I’m actually going to write: I’m so excited to tell you my new book, Animal Lessons, launches today! It’s pretty obvious why I’m personally excited about this (after all, I believe this book is what’s going to allow me to get the word out to the WORLD about what animals are really giving to us humans) – but since I also wanted you to be excited like I am, I’ve extended my pre-order specials for another week! Claim your seat in my May 18th Animal Lessons webinar! Order Animal Lessons today by clicking this link and following the instructions so you can be sure to get your bonuses! 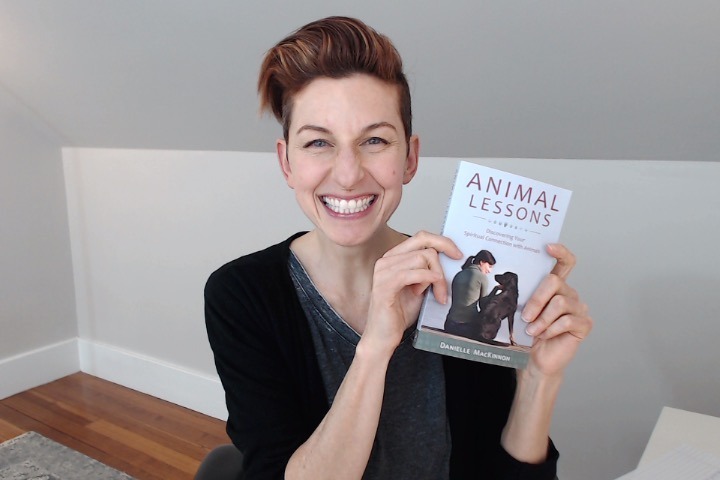 PS: If you’ve already ordered Animal Lessons, but you didn’t yet register for your free gifts, click here and scroll down to the Claim your bonuses section so you can enter your receipt information and get those bonuses! https://www.daniellemackinnon.com/wp-content/uploads/2017/04/AnimalLessonarrival.jpg 480 720 Danielle MacKinnon https://www.daniellemackinnon.com/wp-content/uploads/2018/10/DM-Editable-Logo-new.png Danielle MacKinnon2017-05-08 03:46:002017-05-07 22:40:30Animal Lessons here today! I’m sending you love and light (to Zig too). It’s hard to believe it when we are told the time is coming for our beloved companions, but that’s pretty cool that he told you so you could be prepared! I agree – what a lesson for you! Also, how wonderful to hear that you’re liking my Animal Lessons book Alise! If you can, please go to Amazon and review it here: http://a.co/bL1PMQw. The more reviews I have the more people will see it! Physical Intuitive Energy Part 2 Who’s super sappy today?